1. In your experience, is tight-lacing increasing or decreasing? 2. What is the size of the smallest waisted corset that you keep in stock? 3. What is the smallest waisted corset you have made (a) recently; (b) ever made? Please give bust and hip measurements, if possible. 4. Are corsets worn by younger girls more than formerly? and at what age are real corsets commenced? 5. Do any of your clientèle wear special, or specially arranged underclothing, so as to enable them to lace tightly with less discomfort? 6. Do you think (a) moderate lacing is injurious; (b) very tight-lacing is injurious? 7. What in your opinion are the essentials of a good corset? 8. Do you know of any schools at which tight-lacing is encouraged, enforced, or much practised? Please give fullest details possible. 9. Do any of your customers wear corsets at night? 10. 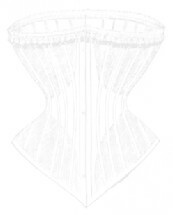 At what age (if a very slender figure is desired) should corset wearing be commenced? Letter to H.Y. from S.S-H.
Rule #1: Have your corsets all made by an experienced corsetier. Rule #2: Be moderate in eating. Rule #3: Put on your corset before eating breakfast. Rule #4: Don't put off your corset when wearing a negligée. Rule #5: Always have yourself laced in by others. Rule #6: During the lacing you should be entirely relaxed. Rule #7: A lady with a tight waist must take time to have herself laced. How tight should I lace a corset? Which problems could arouse from corset-wearing? Is corset wearing popular in Germany? Was it hard to find a corsetier? How do people react when they get to know that you wear corsets? How did you first get interested in corsets? Do you lace the corset yourself or does someone else for you? When do you remove the corset and at what occasions? What kind of clothes do you wear? How do you dress? Do you enjoy wearing corsets in the public? Since the relaunch at 26-Jul-2005 there were 4624613 clicks on the whole website and the actual page was accessed 4123 times.